Just as very few people in 1988 expected that during the following five years Germany would be reunified and the USSR, Yugoslavia and Czechoslovakia would break up, very few people at the moment expect that we might in just five years’ time live in a world in which Quebec, Catalonia, Scotland, Flanders, the Basque Country and several others are independent, sovereign countries. However, history might again happen in one rapid wave. I guess it all started when the SNP gained an absolute majority in the Scottish Parliament last year. However, the wave gained strength when David Cameron in January 2012 decided to allow a referendum on Scottish independence. Of course the SNP would have held a referendum anyway, but Cameron in this was legitimised the process in the eyes of the international community, and it strongly inspired independence movements elsewhere. On the 4th of September 2012, the Parti Québécois became the largest party in Quebec and declared its desire to hold a new referendum on independence. 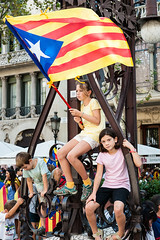 On the 9th of September 2012, more than 1,500,000 Catalans marched through Barcelona in favour of Catalan independence, and already the Catalan politicans have started to talk openly about independence. On 21st October 2012 elections will place in the Basque Country, and as far as I know there’s a good chance pro-independence parties will gain a majority there. What else will happen now? It’s clear the independence movements in various countries are talking to each other, and as soon as the first EU region manages to become an EU member state in its own right, the process will accelerate, because the fear of being chucked out of the EU is one of the major arguments against independence. We live in interesting times, and I’m proud to be a member of the SNP, the party that started the wave.